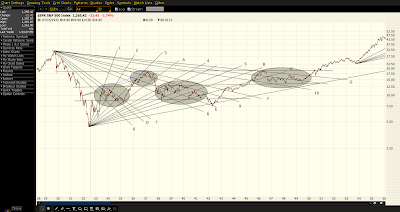 ...characterized by a multi-month pattern within a rising market that has at least two significant touches (of the index or its Bollinger Band) of at least 1.5 standard deviations on the upper and lower extremes of a regression channel commencing after a post-correction new high. It's capped off by a third touch on the lower boundary and subsequent return to at least the midline before a final plunge to new lows. In playing around with the charts this weekend, I discovered another way of looking at these things. 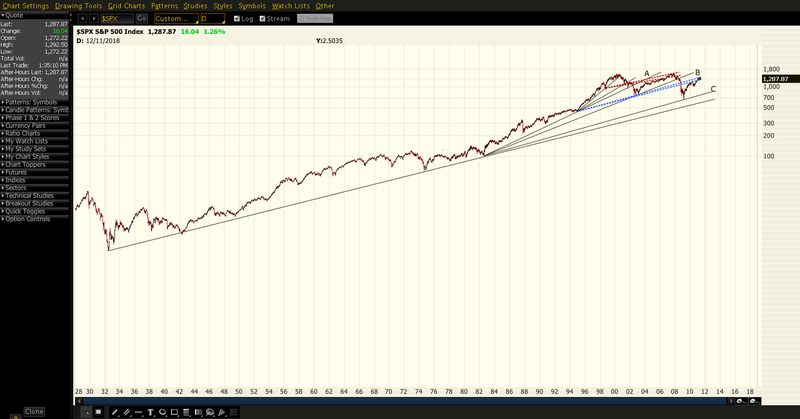 First, look at the SPX over the long-term -- something I don't do often enough. Notice how the market has climbed pretty steadily since the depression (logarithmic scale.) It frequently departs, rising up from the trendline, but always falls back to the long-term slope. We see five touches (1932, 1944, 1949, 1974 and 1982) each marking the end of a significant correction/crash. Consider the first such departure: 1932 - 1942. Follow along and we'll play with some trendlines. Here, I've drawn three trendlines (A, B & C) coming up from the period low. Each is drawn to a significant swing low, as is easily seen. These are called fan lines. You can probably see other spots that might justify one, but let's go with these for now. Notice how they act as support in two or more spots. You can see that once the index finally drops through, these lines often act as resistance -- they limit any further rebound. Next, we'll add a few fan lines dropping down from the period high (D, E, F & G.) Notice how they act opposite to the fan lines from down below. 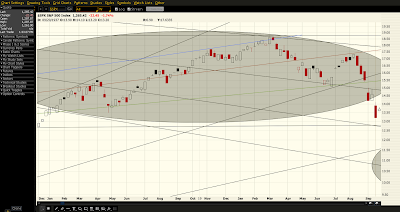 That is, they act as resistance until the index drops through; they then act as support. Notice how many of the fan lines act as support to the index at one time, then turn around and act as resistance later on. Now, let's go crazy with them, and find all the other ones that seem "significant." One such line would be between D and E. It's an important low, although we wouldn't know that until later. I've drawn in a handful that kind of pop out. I've highlighted the areas of increased consolidation. Note that they're all contained within one or two fan line arcs: 1 & 2, 3 & A, 4 & 5 from the low, 6 & 7, 8 & F, 10 & G from the high. I've highlighted these arcs and erased the rest. 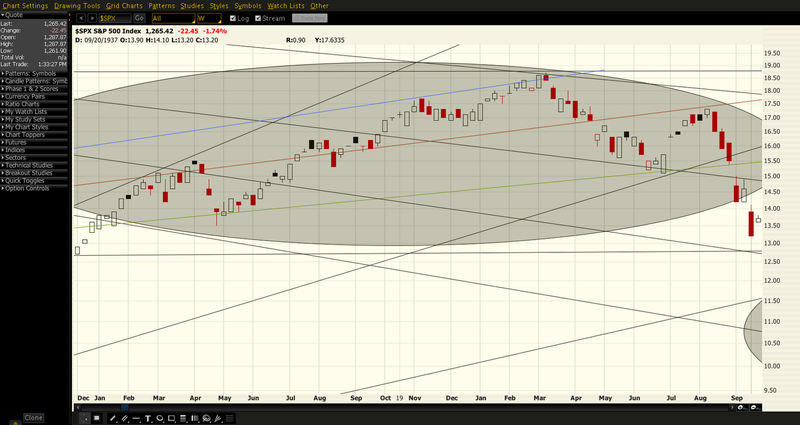 I've also added a few horizontal trendlines that segment and capture horizontal support and resistance. I see a lot of applications and implications. But, first, let's focus on the topping pattern -- since that's the question of the day. I've selected the 1935 - 1937 pattern. 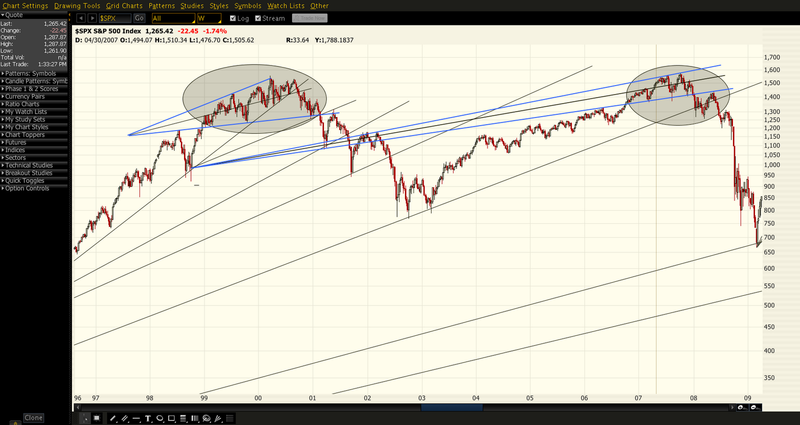 The pattern, seen here, looks a lot like the 2000 and 20007 regression channels, right? Enters at the midpoint, two high touches, two low touches, a final rise to the midpoint, then goodnight Irene. But, notice that the "regression channel" lines are actually trendlines that were drawn from significant points on the previous tops. The low line is connected to the previous high. The high line is connected to the most significant high before that one. 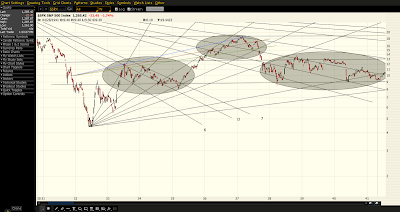 The midline connects the apex of the high and low lines with the entry and exit points for the entire topping pattern. The lower line has 5 significant touches; the top line has 3. Hmmm, where have I seen that before? Let's skip ahead a few years. The 2000 top, which I referred to as a regression channel before, could also be described as contained within 3 fan lines. The bottom line connects the pattern's lowest points with the previous significant high -- just like in 1936. The midline and the top line have nothing to connect to, but if I run them out to the left they intersect nicely, forming an apex with the bottom line. That brings us to 2011. Notice the bottom fan line that connects the pattern's low points with the previous significant high. The top line doesn't have any other highs to connect to, but does extend out to a few very significant lows in 2002 and 2003. And, the midline connects nicely to the apex. 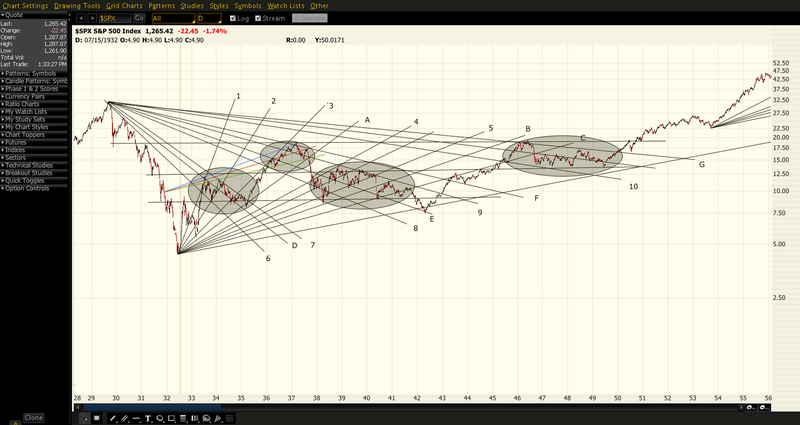 I worried that the current top wasn't large enough in size or time compared with the previous tops or with the previous summer 2010 correction. 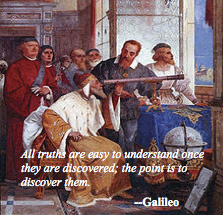 With this new understanding, it's easy to see how and why the top patterns expand. The 100 point range of the past month would grow to 125 points by the middle of August [Sure it Works in Practice] and 165 points by the end of the year. So, is that what's happening? Trust me, I'm working on it. In the meantime, look again at the 2000 and 2007 tops. Thanks to my fledgling understanding of fan lines, it's pretty clear to me that many of the patterns in the current topping pattern have been driven by fan lines from the 2007 top and the 2009 bottom. 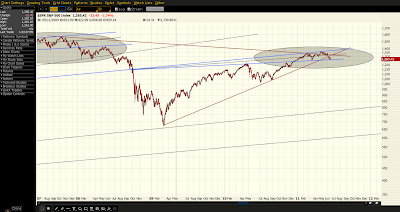 I drew the fan line from the 2007 top [The Trendline That Just Won't Quit], the trendline from the Mar '09 bottom, the midline of this topping pattern, a trendline off the Nov 30 and Mar 16 lows and a trendline from the May 2 and Jun 1 highs. Interestingly, they all intersect around June 23 at about 1320. Now, I don't know whether we're in P or Minor 4. I don't know whether to be more worried about the Puetz window or Three Peaks and a Domed House or the Egg of Doom. Those are issues for another post. But, I have a pretty strong hunch that we'll bump back up from these levels before anything else happens.